I am doing my "factory-style" sewing, making my well-loved fleece socks for my holiday sales as has become my tradition, but meanwhile I am having Daiwabo Dreams. Daiwabo is a wonderful fabric that I saw at a quilt show and bought only a half yard as it can be quite costly and I thought perhaps my husband, once having been a fabric specialist, could help me find it closer to cost. 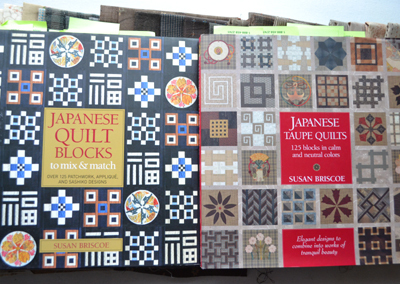 The quilt I saw made of this fabric was a large tumbler tessellated quilt design. It was beautiful in its simplicity and in the richness of the traditional Japanese fancy yarn-dyed Daiwabo taupe fabrics used. It has now been several years since I saw this quilt and became enamored with this fabric, but I have learned that "where there is a will there is a way"! I do believe that there is a fabric genie that makes our fabric dreams come true. 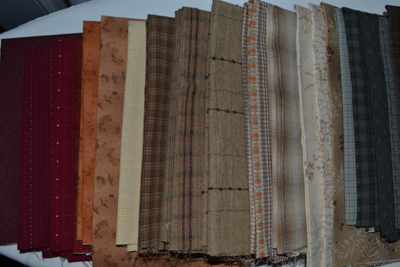 Only a year ago I wrote about the mother-load of wool fabrics that were almost gifted to me following an estate sale and just recently the same thing happened with a lesser, but still significant stash of Daiwabo taupe fabrics! 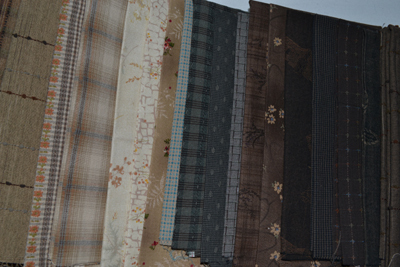 Someone on sewitsforsale.com *was "getting real" about her fabric stash and decided to sell off much of it, thus starting my own collection of Daiwabo taupe fat quarters at less than half price!! 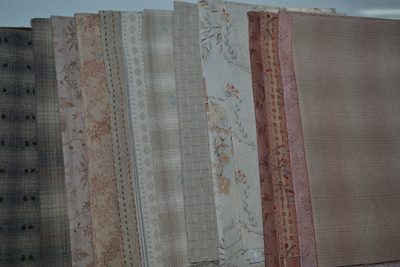 I then found a wonderful on-line retail fabric store, One World Fabrics (https://www.oneworld fabrics.com) that sells Asian Natural/Taupe fabrics along with other special textiles from all over the world and so I am carefully adding bits to my collection by shopping their discounted close out sales. 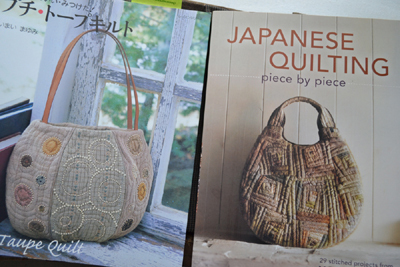 I even found discounted Japanese quilt books through both of these sites as well as at our local Joann's Fabric Store (using my monthly discount coupons) along with the heavy plastic tumbler quilt stencil that I had wanted but was unaffordable at full price! So hang in there my fellow sewers and hold fast to your sewing dreams! Try these unique web sources. You need not quit eating to keep yourself in fabric, books, patterns or threads. "Getting real" isn't for me!! I know that someday I might win the contest for the person who dies with the greatest collection of materials, patterns and notions and my family will host a wonderful estate sale for sewers for my Celebratory Life-Wake and I don't want them to ever feel bad about what I didn't get sewn as I will be in Sewer's Paradise. 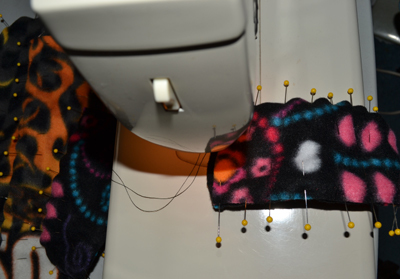 Meanwhile, I continue to "dream on" and create a little bit of heaven right in my own sewing studio! * Note that recently sewitsforsale experienced some computer glitches and so it may take a few days to get their total offerings back up on line.